I feel like I’ve been overdoing the cat blogs lately, but then again with four cats I’m overdoing the whole cat thing, so I guess it follows suit. We’ve not had a TV in our room for a couple of years now, but since I’ve been sick a lot lately we set one up again and good old Dan sprung for another satellite box and everything. 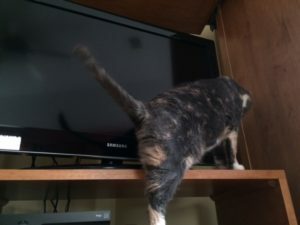 So suddenly the cats had access to a very exciting TV cabinet that had been closed up for a long time. We knew that they would jump behind there, and possibly even get stuck, because it happened with our last batch of cats. Dan ended up cutting out a hole in the back of the bottom of the cabinet so stuck kitties could escape. Sure enough, Helen goes flying back there one morning. I hear her pawing around. See her head pop up. She makes attempt #1 of 483 lame tries to leap back up out of the cabinet, succeeds only in bashing her head against the wood shelf. 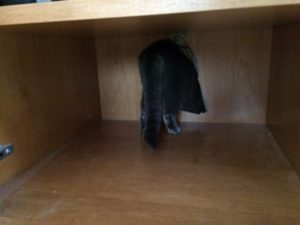 I open the bottom of the cabinet to see why she isn’t climbing through the hole and it is immediately apparent that although the hole is big, it’s not Helen size. I mean, so few things really are. Now Helen is meowing up a storm and I don’t know if she’s caught on cables and stuff or what, and I have no choice but to call Dan, who then uses his lunch hour to dash home and somehow lean all the way back there and grab her and yank her out. Where she promptly stretches, yawns, and strolls away. Ingrate! So when Dan got home that night, out came the saw. He enlarged the hole so even Helen can fit through if necessary. For now. This entry was posted in Uncategorized and tagged Animals, Drama, Humor, Stupidity. Bookmark the permalink. In my humble opinion, there’s no such thing as too many cute cat stories! We routinely cat-proof stuff around the house and yet someone will succeed in getting stuck somewhere. Their latest favorite place is inside and under hubby’s new recliner. Our quiet kitty, Jane, has taken to watching TV lately ~ she actually pays attention! So now I suppose she’ll want her own recliner, too. I’m so glad you like the kitty stories! And yes, cats have a way of getting themselves into the worst predicaments. I guess that’s why they need all 9 lives. And I need to advocate for Jane–I see no reason why she should not have her very own Laz-E-Cat recliner with a little pocket for the remote. And a drink holder for the bottled water you no doubt serve her. LOL . . . you nailed it, Jill!! Good to know Jane is comfy! It seems we will do anything and everything for our pets. I think that’s how it should be. I only have dogs and birds but love hearing about the cats. They’re stories are amewsing – keep them coming. Glad you find the stories, ahem, amewsing! I love hearing about your dogs and birds too! An animal lover is an animal lover…we at least understand what it’s like to love our pets as much as we love some people. And a bit more than we love some other people! My favorite part was that Dan came home from lunch to rescue Helen. It says a lot about him, all of it good. I love cute cat stories, when my husband was in the hospital, I would call my friend, Carol, every morning at 6 am, while I drank my coffee (I slept at the hospital most nights). I would cry and she would commiserate (her husband also died after being very ill). Then once I felt better, she would tell me what her cats had done the day before (she had 3 kittens). It gave a touch of normalcy to my crazy world. I think cute cat stories saved my sanity. Yes, Dan is one in a million. And if you ever need more cat stories, well, I’ve got plenty! I’m so glad your friend’s kitten antics cheered you up when you needed it most. 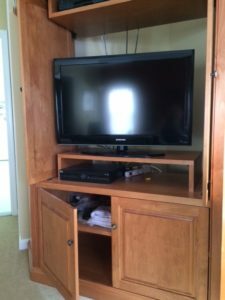 We have a corner TV cabinet in our bedroom. The back was open. 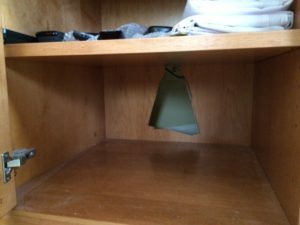 There was even access to the drawers from the back. I would hear shuffling inside the drawer and when I opened it, Mollie was scoothing the sheets to take a nice nap. We ended up putting plywood on the back so she couldn’t get in there. No one seems to like to sit on the shelf itself with the TV so we consider ourselves lucky. The world always needs more cute cat stories. Then again I am as addicted as you are. Yes ours is a corner cabinet too. It seems as if there is nowhere that one of the beasties can’t nestle into. I love the way you make room for everything.